Insight can propagate horizons starting from individual seed points or from existing interpretation. You can use a combination of these tools to achieve good results from even the most problematic data. Note: Because the propagator is waveform based, Insight will propagate horizons in the time domain (where possible). When propagating a depth volume with a velocity model configured (Time/Depth Conversion), the data is converted to TWT. When picking depth horizons on a depth volume, this conversion is unnecessary. For best performance, temporarily clear the Time/Depth Conversion settings. This will force the propagator to operate in depth. Select the Volume to pick and propagate. Select a horizon to use as seed points to pick an entire area. Especially useful for heavily faulted or poor-quality data with events that lack a consistent waveform. The amount of each trace to compare. Defined in distance (or time) distance above and below the starting point. Tip: Reducing the value can help prevent the propagator from moving to a different event or oscillating between two similar events. The event type is used when placing seed points and also to update the pick (when snapping is enabled). Note: A peak is a sample that is larger than the sample values on either side, or larger than one and equal to the other. Consequently, the first or last sample of a range can never be a peak. Snap Limit (when snapping is enabled): The maximum distance to adjust the result. Faults: Enabled to stop the propagator from traversing across visible faults. Fault Polygon: Select a map polygon to to stop the propagator from picking inside the area. The propagator will operate outside the fault polygon. Note: Seed points must be inside the polygon/probe. Click the Seed points pencil icon to enable picking mode. Go to a section view to pick the seeds. 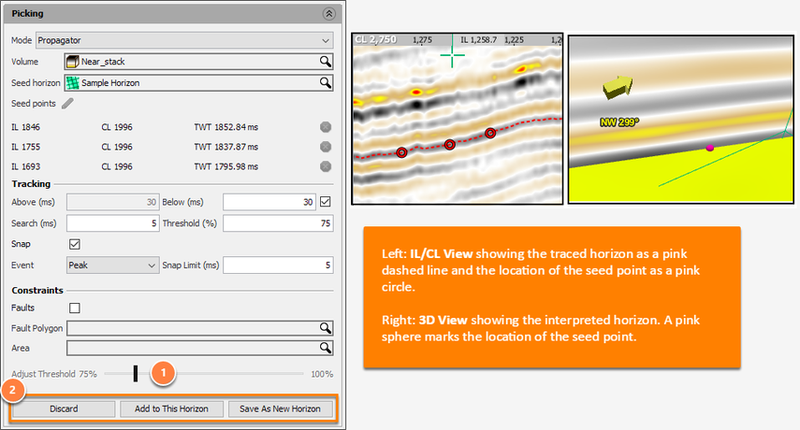 Picking can be done in section views, gather views and the 3D view. To start propagating, click Propagate. Insight will track the event in all directions using the parameters. Views are updated on the fly as the propagation runs. The propagated result is displayed as a dashed line in all intersecting views. Note: Propagation seed picks cannot be saved. They are incorporated into the picked horizon. Tip: For a list of hotkeys for horizon picking see the Hotkeys page. While the propagation is taking place, and after the propagation is complete, the displayed threshold can be adjusted. Adjust Threshold: Display only the areas of the result above the threshold confidence. Increasing the threshold crops the result to areas more consistent with the original seed picks. The picked area will decrease. The hidden, lower-confidence picks are not included in the final result. 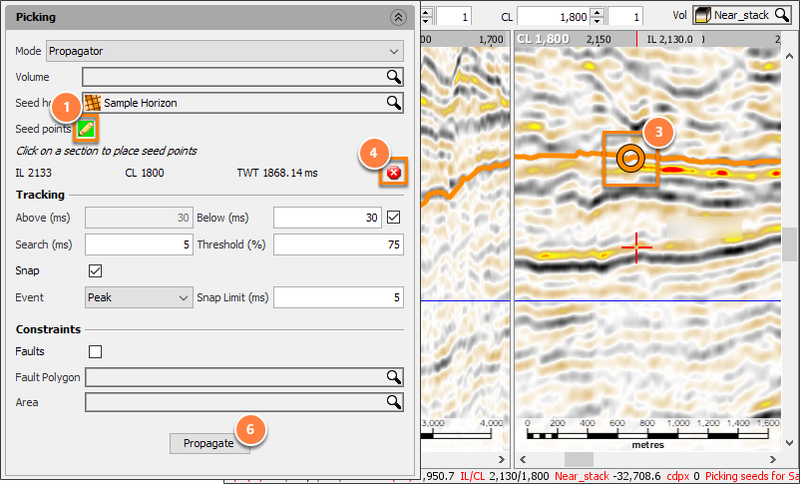 As a general rule, use higher values in areas of complex stratigraphy. This will result in smaller parts of the horizon being defined from each seed. Discard: Cancel this calculation and delete the results. Note: If you are not the owner of the horizon, you cannot update the original horizon with new picks. Take ownership before adding the propagated result. Alternatively, make a copy of the horizon (see Copying a Horizon). Review the result in section views (e.g. IL/CL View) to see how the surface has been defined. The results are also available in the Map View. Select the horizon from the Horizon drop-down in the navigation bar. The defined horizon will be displayed in plan view. Note: In the map view, if the volume time/depth slice is displayed and is above the horizon, it will block the view of the result. Click the green circle beside the time/depth drop-down box to disable showing the time/depth slice. When propagating results to an existing horizon, previous picks displayed with partial transparency. New interpretation are shown in solid colour. 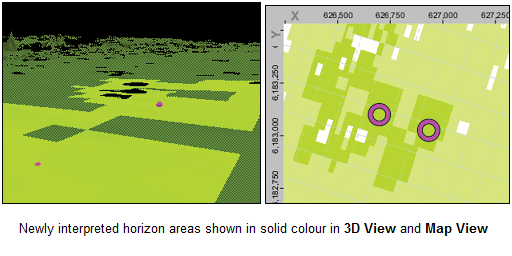 Use probes in the 3D View to restrict the propagation to an area of interest (see Creating a Probe). In the Display tab on the left, enable Clip to Probe and select the probe. The 3D display will be clipped to the probe. Configure the propagator (described earlier). 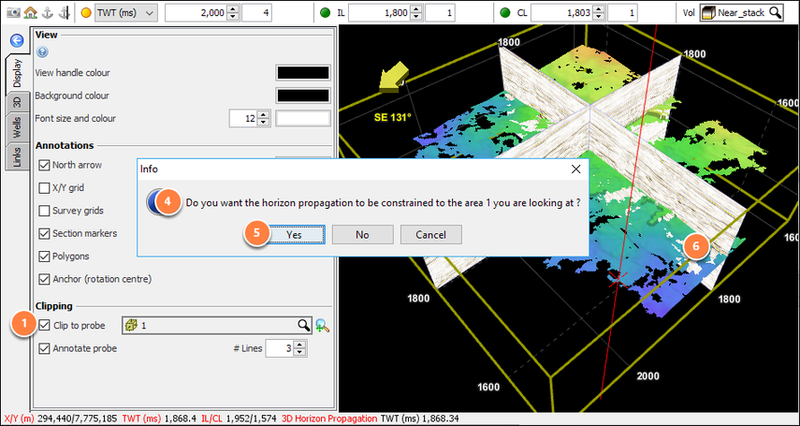 Insight will show: "Do you want the horizon propagation to be constrained to the area 'probe_name' you are looking at?". Insight will use the 3D probe as an area constraint. This can help speed propagation. 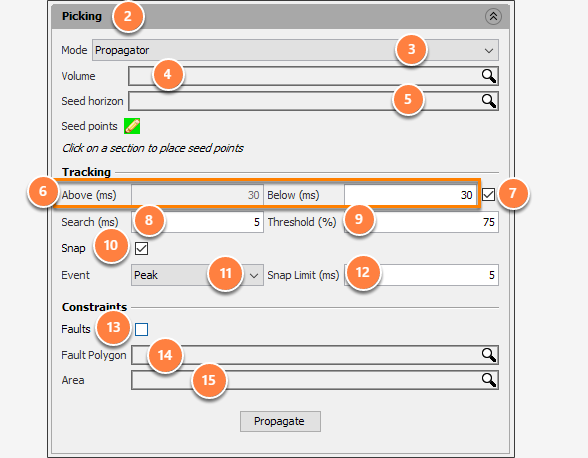 Use propagator-guided manual picking to pick a lattice of high quality points on regularly spaced lines. Review the points for consistency and quality. Use the automatic propagator to extend the high quality picks to the best matching neighbours. Use the lattice horizon as a seed horizon for the propagator. Start with a high threshold. Propagate and add to the horizon. Set the current horizon as the seed horizon. On early iterations, use a high threshold and in later passes, lower the value to extend the propagation. In problem areas, add additional manual interpretation or seeds and repeat the automatic propagation until full surface is achieved. Finally, use horizon interpolation to fill any small remaining gaps and missing points.